DONALD SINGER: HEALTH, ART AND SCIENCE: Lichfield Festival 2012 Lecture - Poetry and Medicine, the Hippocrates Initiative and haiku. 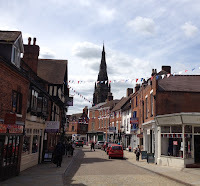 Lichfield Festival 2012 Lecture - Poetry and Medicine, the Hippocrates Initiative and haiku. @HealthMed The 2012 Lichfield Society Lecture organised by Jenny Arthur, LSES, at the Lichfield Festival was on themes arising from the first 3 years of the Hippocrates initiative for poetry and medicine and included readings by winning poets Wendy French, Michael Henry and Tricia Torrington, followed by a panel discussion. One of the many interesting questions raised at the Lichfield Festival session devoted to the Hippocrates Initiative was whether sophisticated medical science is a suitable theme for poetry. In fact many of the poems in the each of the initial three 46 poem anthologies of winning poems in the 2010, 2011 and 2012 Hippocrates awards deal with complex medical themes in an accessible way. M Henry, T Torrington, W French, J Arthur, D Singer. Indeed the open international winning poem in 2012 by Mary Bush from Texas - 'Woman's work' - dealt with tissue engineering. This featured both within an interview with Mary Bush on the BBC's Woman's Hour and was the theme for an article in the latest issue of international science journal Lab Times. There was also a discussion about haiku followed by opportunity for the audience to write their own. The audience of scientists and engineers were enthusiastic in creating haiku on the day, aimed at introducing a wide range of medical themes in an accessible short format.